If Dustin Johnson is the poster child for golf's new breed of super-athletes, then Gary Woodland is the cover boy. At a muscular 6'1” and 195 pounds, Woodland is built like an NFL wide receiver. Like Johnson, he played both golf and basketball growing up, attending Washburn University for a year on a hoops scholarship before transferring to the University of Kansas to pursue his golf career. The rest, as they say, is history. Actually, Woodland's story is just beginning. His incredibly powerful swing – which produced an average drive of nearly 311 yards in 2011 -- appears perfectly suited to golf's 21st-century demands (like 7,600-yard courses). Woodland has already claimed his maiden victory, the 2011 Transitions Championship, and teamed with Matt Kuchar to win the Omega Mission Hills World Cup the same year. Woodland's swing appears as well-built as his physique. Woodland's signature: When hitting the driver, Woodland strikes the ball with a decided upward blow, increasing the club's loft and maximizing distance. Who else does it: The majority of pros hit the ball with some degree of upswing, which is the recommended method with today's gigantic drivers. Before discussing Woodland's impact position, let's examine how he gets there. From the top, Woodland's body drops downward, a la McIlroy and Tiger Woods, bringing the arms and club along. He makes a major rotation throughout the downswing, with his hips extremely open – perhaps as much as 70° to the target line – at impact. Why it works for Woodland: Sure, he's an exceptional athlete. But it's his sound technique that helps Woodland get the most from his talent. By striking the ball on the upswing, he launches it very high and with minimal backspin, generating drives that fly high and stay airborne forever. He also does a great job of staying down and behind the ball through impact, then extending his right arm well into the follow-through. Tee the ball so at least half of it sits above your driver's top line. Stand with the insides of both feet directly beneath the outsides of your shoulders. Place about 60 percent of your weight on the right side (for right-handed golfers). Your right shoulder should be slightly lower than the left. Now simply swing away, making sure to stay behind the ball with your head, with the shoulders square at impact. Driving distance is always a popular topic of conversation among golfers. Everyone wants to hit the ball a little bit farther – especially if that gain means they will be able to hit it past their playing partners. There is nothing quite like the feeling of hitting the longest drive in your group, and most players will stop at nothing to squeeze every possible yard that they can out of their swing. If that sounds like you, one step you can take is working on the angle of attack that you use when striking the ball with your driver. Launching a driver from the tee is different than any other shot in golf. This is the only shot that you hit where the ball is well off the ground, which presents you with some unique opportunities. When the ball is on the ground, such as when you are hitting an iron shot from the fairway, you need to hit down in order to make clean contact. That is not the case when the ball is teed up two or three inches above the turf. With that kind of space between the ground and the ball, you could choose to hit up on the ball with your driver – and that is exactly what you should do. Hitting up on your driver will allow you to achieve the optimal launch angle for your drives. Simply put, that means you will be able to hit the ball farther with the same swing speed. Most golfers, when trying to hit the ball farther, focus their attention on learning how to swing faster. While additional swing speed will always help, there is something to be said for fine tuning the speed that you already have in place. Most likely, you are not currently getting the maximum possible distance from the speed you are producing. Before you go chasing down ways to add one or two miles per hour to your swing, make sure you are doing all of the 'little things' correctly. Because of the difference in hitting the ball off of a tee and hitting it from the ground, it is best that you think of your driver swing as being completely different from the rest of your swings. The shape of the swing is different overall, as is the way you use your hands through the hitting area. While there are bound to be plenty of similarities between your driver swing and your other swings, it is important that you understand the differences. Give yourself plenty of time on the driving range to get comfortable with your driver swing, as it is one of the swings that you will use most frequently on the course. The putter is likely more valuable overall in terms of posting a good score, but the driver still plays a crucial role in the quality of your game. Possessing the ability to step up onto the tee and launch an accurate and powerful drive time after time will allow you to conquer even the toughest of courses. Golf is a game that is all about spin. Although you can't really see it with the naked eye while the ball is flying through the air, every golf shot that you hit has some degree of spin. It is that spin that will be largely responsible for the path that the ball takes toward the target. Side spin will make the ball curve to the left or right, and back spin will cause the ball to climb higher into the sky. When it comes to hitting up into the back of the ball, it is really the back spin rate that we are concerned with controlling. While a high rate of back spin can be a great thing on wedge shot, it is almost always a negative when talking about the driver. When hitting down on the ball, you are taking an action that will maximize the amount of back spin on the shot. This is why it is so important to hit down on your irons – because it will enable you to load the ball up with spin to then stop it quickly on the green. Once you have hit down, you will be left with a tee shot that has a lot of back spin, so the ball will climb high into the air as a result. Most likely, the shot will balloon up into the sky and then fall relatively straight down to the ground. This shape will serve to shorten the overall length of your drives, because the ball will waste too much of its energy in an upward direction. Rather than using speed to travel further down the fairway, it will be burning energy as it goes higher and higher. Also, when the ball does land, it will have little bounce and roll thanks to the high trajectory. When you see professional golfers launch the ball high into the air with the driver, they are doing so using a flat and boring trajectory which maximizes their overall distance. A flat trajectory is great because it allows the ball to carry as far down the fairway as possible, and then when the ball does land, it will be able to bounce and roll for added yardage (depending on course conditions). So, hitting the ball high is not necessarily a bad thing, but hitting it high due to a high spin rate is trouble. You want to launch the ball into the air using a combination of an upward hit and the proper loft on the face of your driver. When you learn how to master these important launch conditions, you will see the distance of your drives increase – even if you don't swing any faster than you did before. By now, you are hopefully convinced that hitting up on the ball is the right way to go. The next step, of course, is learning how to do just that. Hitting up on the ball can be a little difficult since it runs counter to what you are trying to do with the rest of your swings. Most likely, you have drilled yourself on learning how to hit down on your irons, so now you are going to undertake the process of learning how to swing the opposite way. However, if you are committed to adding distance to your drives, you will be willing to invest the time in this process. Following is a list of three crucial points that will allow you to hit up on the golf ball at impact when swinging the driver. Center of gravity behind the ball. This is the most important point to keep in mind when trying to hit up on your driver – your center of gravity needs to be behind the ball at impact. Since your swing is going to bottom out directly below your center of gravity, you need to make sure that point is behind the location of the ball in your stance. The club has to have reached the bottom of its arc and begun to move back up if you hope to make contact up the upswing. Many golfers slide toward the target during their downswing, which moves their center of gravity to the left – and often beyond the position of the ball. To avoid that mistake, do your best to stay centered throughout the swing. During the backswing, your weight should be evenly distributed between your two feet, and it should only move slightly left in the downswing. When you combine good balance with a ball position that is up near the left foot, you will be able to hit up on your driver each and every time. Tee the ball up high enough. You probably think this is an obvious point, but it is amazing how many players don't actually tee the ball high enough to hit up effectively. Considering the size of the modern driver head – most are 460cc's, which is the maximum allowed under the rules – you need plenty of space under the ball if you are going to find the sweet spot while swinging up. A 'regular' length tee usually won't do the trick, so make sure you always have at least a few long tees in your bag when you head to the first tee. As a good rule of thumb, the ball should be positioned to where the middle of the ball is even with the top line of the face of your driver at address. This might look a little too high to you at first, but you will find that it is the perfect height for hitting up on the ball with confidence. Turn it loose. You aren't going to be able to hit up on the ball if you never fully release the club head through impact. 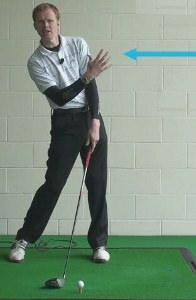 You can get away with 'holding on' to your release while hitting down on an iron shot, but that simply isn't going to work with the driver. 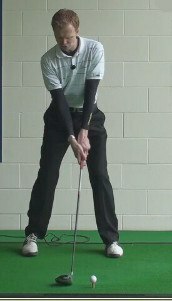 Since your hands need to roll over through impact if the club is going to start working back up away from the ground, it is important that you have enough confidence in your swing to release the club fully through the hit. Build up your confident on the practice range so you don't feel like you need to hold anything back while on the course. It is a great feeling when you finally trust your swing enough to release the club head through impact, and you will find that this action alone can help you to unlock additional yards. The essence of what you need to do in order to hit up on the ball can really be boiled down to this – keep the ball forward in your stance, and keep your weight centered. If you can do those two things, along with making sure you have a nice release through impact, you will be in great shape to hit up properly. Most often, players struggle to hit up on the ball due to poor weight distribution during the swing. They wind up too far left as the club is swinging down, and they have nearly no chance to actually hit up on the ball from that position. By learning how to stay balanced throughout your swing, you will have a great chance to be successful. As an added bonus, that balance will also help you with the rest of the swings you make around the course. It is unlike that you will start to blast perfect drives as soon as you start to focus on hitting up through impact – more likely, you are going to have to make a few adjustments along the way before you settle in to a sweet spot that leads to great results. Don't worry if you aren't having as much success as you would like right off the bat. It is totally normal to struggle at first, and sticking with it until you find the right combination of stance and swing is simply part of the job. 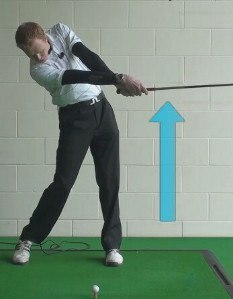 One of the basic adjustments that you will need to make is to your tee height. While it is true that you will want to tee the ball up nice and high, what that means exactly is going to vary from player to player. Some players find that they hit their best drives with the ball teed up extremely high, while others like it slightly lower. There is no right or wrong in this case, as long as you have enough room to swing up from under the ball without making contact with the ground. Find a driving range where you can hit off of grass so you can experiment with various tee heights until you find one that you love. If you are having trouble placing your tee in the ground at the same height shot after shot, consider marking some of your tees with a guide line that you can use to make sure you are teed up just right each time. Consistency is crucial in golf, so paying attention to this kind of small detail could pay off big time. Another adjustment that you are going to have to make relates to your ball position. It is extremely important that you get the ball into the right position in your stance, as having the ball in the wrong spot can ruin all of the other good work you do in the swing. Again, this comes down to trial and error on the driving range. To start, line the ball up with the inside of your left foot at address. If needed, place a club on the ground that is touching your left heel and is perpendicular to the target line. This club will serve as a guide to help you get the ball into the right spot. After you have hit a few shots with the ball lined up off your left heel, adjust as necessary to improve your results. If you feel like you are catching the ball too low on the club face, move the ball back in your stance just slightly and try again. On the other hand, if you are hitting the ball too high on the face, move it up a little farther to the left before hitting a few more shots. It shouldn't take much time for you to zero in on a ball position that will lead to the best possible results. There is one other adjustment that you should keep in mind while practicing your driver swing – the distance you are standing away from the ball. This is a point that many golfers overlook, but it can have a profound impact on the kinds of shots you produce. If you are standing too far from the ball at address, you may be prone to hitting a quick hook that dives to the left. Or, if you are standing too close, you could have trouble avoiding the big fade and the loss of distance that comes with it. Watch your ball flight patterns closely and make the necessary adjustments as you go in order to dial in your trajectory. Golf is an ongoing battle, and it is game that you will never master. You shouldn't look at this process as something that will be completed and forgotten about – rather, you will need to continually work on your driver swing. If you are anything like every other golfer in the world, you will go through good and bad periods of performance off the tee, and your swing will need to be tweaked from time to time. When making those tweaks, remember to keep in mind just how important it is to hit up on the golf ball with your driver. The driver that you are holding in your hands is also going to play an important role in the shots you are able to produce and the distance you can achieve. Specifically, the flex of the shaft you are using and the loft of the driver head are two key elements to consider. Hitting up on the ball should lead you to the best possible ball flight for your swing, but that is only going to be the case if you have the right driver. If you are trying to swing a club with a shaft that is too stiff or too soft, for example, you will never be able to dial in the ball flight just right. As you are learning how to hit up on the ball with your driver, watch for problems that might be a sign of equipment issues. Specifically, you should be observing how high the ball flies in the air, and how flat that trajectory is as it moves down the fairway. If you are hitting up nicely and still getting a ball flight that balloons into the sky, there is a good chance that you have a shaft which is too soft for your swing. On the other hand, if you are making a good swing and you can't get any height at all, your shaft is likely too stiff. Somewhere in the middle is the right driver shaft for you, and a professional club fitter can help you track it down. Consider setting up a club fitting at your local course to locate the equipment which will give you optimal results. Remember, it isn't always the latest and greatest equipment – or the most expensive – that will be best for your game. Try to go into any club fitting with an open mind so you can walk out holding the driver that is going to maximize your distance potential. If you head into the process with preconceived notions of what is going to work best for you, the club fitting will largely be a waste of time. Keep your mind open and listen carefully to the advice you are being given before selecting the right club and shaft combination. Hitting up on the ball with your driver is something that you should learn how to do as soon as possible. If you have been hitting down all these years, you have been wasting yardage and you probably didn't even know it. There are only a few basic adjustments required to start hitting up on your driver, and the results can be amazing. You might need to have some patience at the start of the process while you are working out the kinks, but you will be rewarded in the end if you stick with it until your ball flight takes shape successfully.